Does my blog need yet another chicken wing recipe? Admittedly, the answer’s probably no, but here we are. 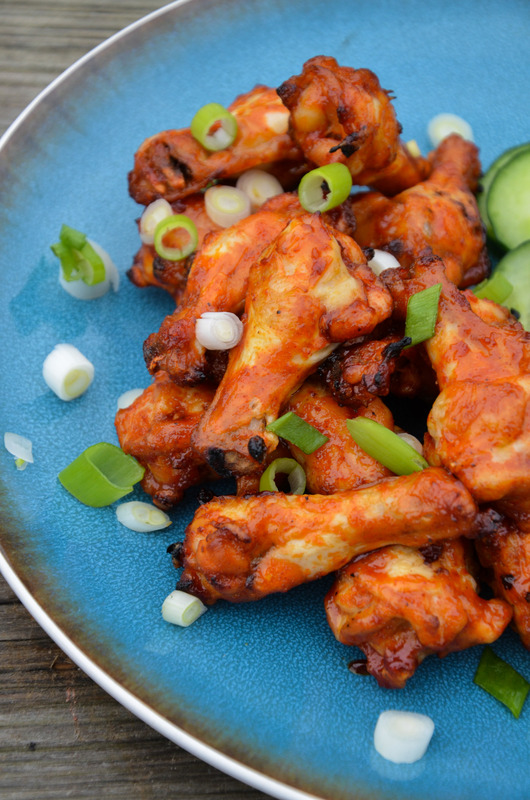 These recipes are quick, easy and the results are delicious, and this one’s no exception–pop the into the oven, make the easy gochujang-based sauce whilst the wings cook, and then gobble them up. So what more could you ask for really? These wings are somewhat spicy, sightly tangy, and we chose to serve them as they are with just a quick sesame cucumber pickle, to take the edge off that heat. I cannot believe there’s finally some nice summery weather, and I have a cold. Really? Why, body, why? I guess it’s because I’m finally relaxed after leaving university for the summer and returning to home home, but I can’t say I’m a fan. And as a pick-me-up, we have these meatballs. There’s something comforting about them, with the quietly warm spiced coconut curry sauce that combines ginger and lemongrass and cardamom to name just a few, and the gentle heat of the chilli in the meatballs. Here’s to hoping they help to kick this stupid cold. I chose to bulk it up just a little with some sliced shiitake mushrooms, though other meaty mushrooms, like oyster mushrooms, would do a fine job too. To make it a full meal, I added my father’s favourite; rice cakes. I don’t know what it is about rice cakes, but he absolutely adores them. So he was happy. And there’s my new little addition to my bowls for photography and styling, as I mentioned in my instagram post. Ain’t it cute? It came pretty cheap too, so I’m pretty pleased. It looks nice against the warm yellows of this dish. Plus side? Oven baking obviously makes it healthier, and makes you feel full, without like a bag of lard that heavier fried foods make me feel afterwards. Result.